Zoom currently has 15% off when you spend £20 at their eBay store so this works out cheaper than using the 10% signup10 code on the main website. Bought via main site day before yesterday, received today. Heat added. Great find. Have been after the 4k bundle, but missed the previous 20% off offer, so 15% is good enough. Don't forget 2% TCB as well. peops, is this more likely? Some of those films though. Mintcake already given that link in his 2nd post. The uhd player bundle is all uhd. Why would you want uhd on the standard player? Also worth noting that the player in the £59.50 bundle plays 3D blu-rays too. the blu-ray player hasn't got iplayer, itv hub or other freeview catchup according to samsung site and currys listing? after a 3d smart blu-ray player with iplayer, itv hub,4od, all freeview for my dad. Why don't SMART stuff have them all?????????? how can you get for £59 when advertised at £20 more? Can anyone clarify smart facilities? 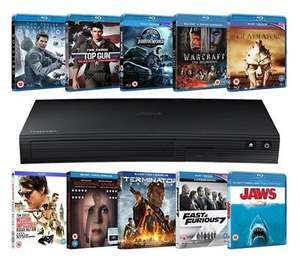 Be careful with thd peice on things because what they do is put a price down then stop it and relist for either the same price or more the week before or more than and like theze blu ray players , it saus £59.99 but yoh click the page and its £69.99 For the same one . No discount applied at checkout so I haven't clicked on "confirm and pay"